Have you been looking for a Stand Mixer? If so, here's a really awesome price! 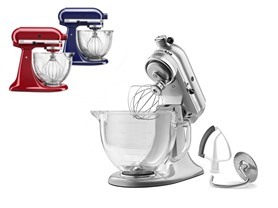 Right now you can get this KitchenAid 5Qt Tilt-Head Stand Mixer with Glass Bowl $229.99 (Retail $359.99). With 10 speeds, the stand mixer will quickly become your kitchen's culinary center as you mix, knead and whip ingredients with ease. For even more versatility, the power hub fits optional attachments from food grinders to pasta makers and more. Turn your stand mixer into a culinary center. With more than 15 optional attachments use the power of your stand mixer to help you make fusilli pasta from scratch, shred a block of parmesan cheese in seconds and so much more. 5-Qt. glass bowl with measurement markings adds an extra touch of elegance to your kitchen. The glass bowl features a convenient pouring spout and easy-to-read, graduated measurement markings. -The power hub turns your stand mixer into a culinary center with more than 15 optional attachments available. -5-Qt. glass bowl with measurement markings adds an extra touch of elegance to your kitchen. -The Flex Edge Beater thoroughly scrapes ingredients into the bowl. -10 Speeds - Powerful enough for nearly any task or recipe. -The tilt-head design allows clear access to the bowl.